For students learning English as a Second Language-- ESL, reading is extremely important. You can learn about a language by studying its vocabulary, grammar, and pronunciation, but to understand and speak it there is no substitute for listening and reading. Your mind makes connections and recognizes the normal patterns of English as you concentrate on understanding meaning, not just words. Reading is a wonderful way to increase both your vocabulary and your fluency in English. As you soon as you understand enough English to focus on the author’s ideas, you will absorb the words and structures you read almost unconsciously. Don't look up every new word. IF you still feel unsure and the word seems important (or if it is used repeatedly), then look it up. Was your guess close? As you improve at guessing and understanding from the context, your reading comprehension will also improve dramatically. Remember, the point of reading is not to recognize a lot of words, but to understand what the author is saying. 2. Adjust your reading speed to your purpose. Not all reading is the same. When you are looking for one piece of information you can scan quickly for the right section. 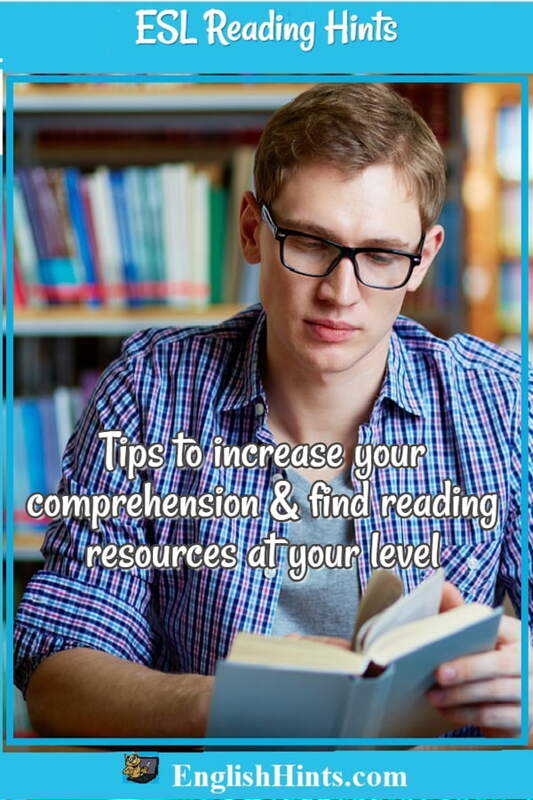 To read difficult academic text or study for an exam, you must concentrate. Look for the main point and the most important details. If you are reading for pleasure, you can read more quickly, without looking up as many words. See Reading for Specific Purposes for more suggestions on effective reading. Check your reading skill gives a practice reading and questions so you can see how well you can use these skills. Reading Strategies for Comprehension Practice gives more reading tests and practice activities (interactive versions), and Reading Comprehension Worksheets and Listening and Reading Comprehension Exercises each give the pdf versions of some of those pages. for some good places to start and some specific books and authors.